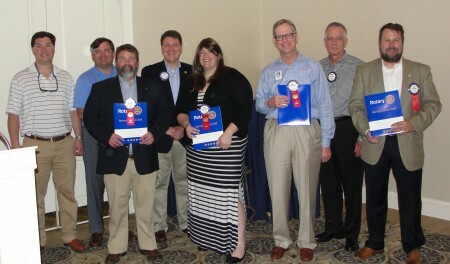 A fabulous day for the Auburn Rotary Club and Rotary International as four new members were inducted into The Rotary Club of Auburn on March 22, 2017. Pictured front from left to right are: David Clegg, realtor with Homegrown Properties; Dr. Jennifer Robinson, member of the Auburn University psychology faculty; Mike Knight, real estate associate with First Realty; and Seth Tuttle, development officer with the Alabama 4-H Foundation and previous Rotarian. Pictured alongside new members are Drew Goodner, the club's membership director, David Reaves, David Clegg's sponsor, Michael Tullier, club president and Fred Bennett, Mike Knight's sponsor.